The retail bond space has just become exciting with the launch of two new frameworks last Thursday. Small investors can look forward to a wider range of retail bonds over time, up from the current 11. Under the new rules, firms that issue bonds can do away with the need to issue a prospectus - which requires time and effort to prepare - to offer bonds to retail investors. 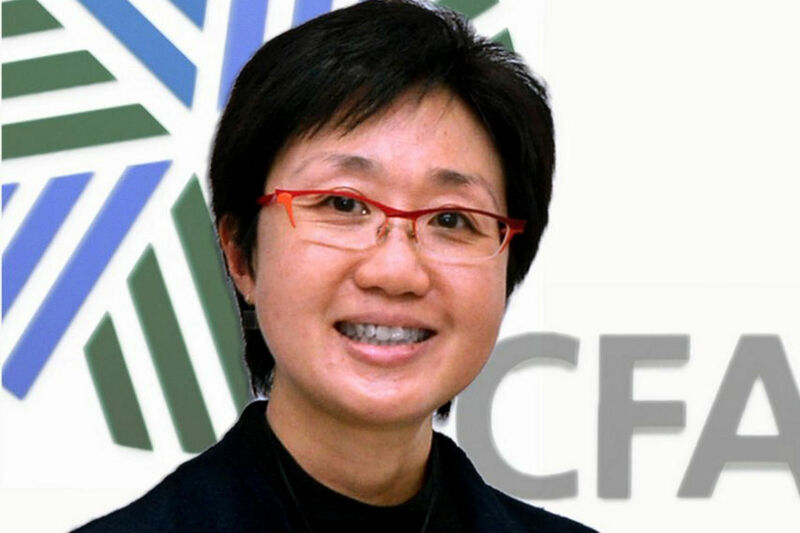 Ms Tan Lay Hoon, CFA board member and co-chair of advocacy at CFA Singapore, said any company listed on the Singapore Exchange (SGX) can issue bonds as long as it issues an Offer Information Statement. She said: "The 'seasoning framework' simplifies the documentation, time and cost for the eligible companies which would like to issue bonds to the public. "The issuer is able to issue to institutional and accredited investors first to set a benchmark price and, after a six-month seasoning period, reopen the existing issuance to offer to the public." Retail bonds are an asset class offering investors an opportunity to diversify their investments and earn a better yield than bank deposit rates, which are close to record lows. Bonds are generally perceived as less risky than equities. Last year, there were four retail bonds listed on SGX. 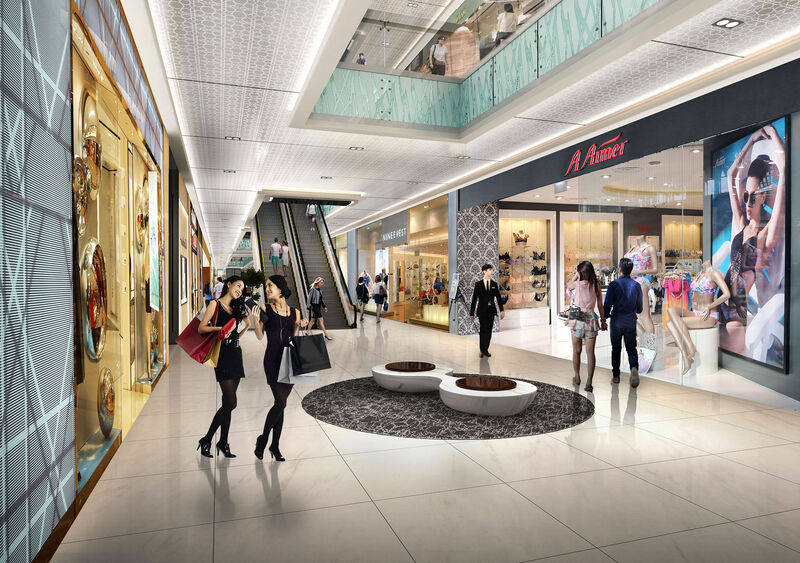 So far this year, there have been three retail bond listings, all with four-year tenor, from Oxley Holdings (coupon rate of 5.15 per cent a year), Perennial Real Estate (4.55 per cent) and Aspial Treasury (5.3 per cent). Hyflux is offering 6 per cent perpetual securities and the offer will close at noon on Wednesday. 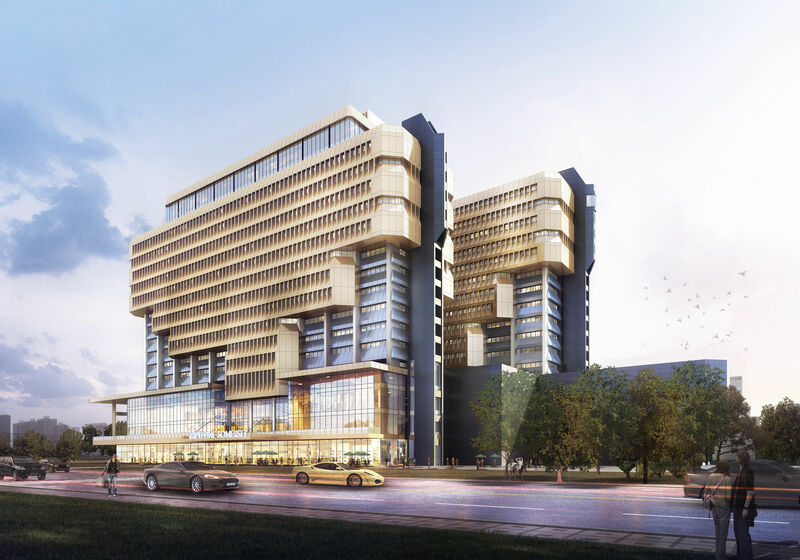 One potential issuer that retail investors will likely look out for is Temasek Holdings, which has said previously that it was looking at offering retail bonds. Mr Vasu Menon, OCBC Bank's vice-president and senior investment strategist, recalled that before 2010, the bond market here largely catered to institutional and high net worth individuals, as most bonds required a minimum investment of about $250,000. It was only after September 2010 that corporate bonds for retail investors were made available on the SGX. The Sunday Times highlights the frameworks and the factors that retail investors should look out for. What are the enhancements? 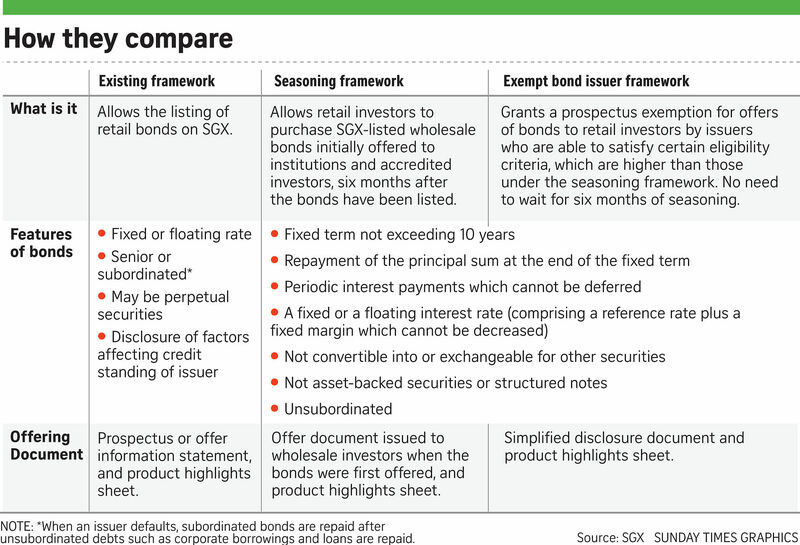 The bond seasoning framework will allow investors to buy wholesale bonds in denominations as small as $1,000 on the SGX with only a product highlights sheet. To mitigate the risk that comes with relaxing disclosure requirements and providing retail access, the framework requires that only bonds that have been sold to institutional or accredited investors and listed on the SGX for at least six months - or seasoned - may then be sold to retail investors with just a product highlights sheet. Accredited investors are those with net personal assets exceeding $2 million or whose income is not less than $300,000 in the preceding 12 months, and corporations with more than $10 million in net assets. There are also minimum hurdles on the issuers' size, listing history and creditworthiness that must be crossed. Only bonds that bear plain vanilla structures may be sold to retail investors under the framework. CFA board member Tan Lay Hoon says the framework simplifies the documentation needed for firms to issue bonds to the public. "Re-taps" are allowed, in which an issuer makes subsequent direct offers of bonds to retail investors under the same terms as the existing wholesale bonds without a prospectus, following the six-month seasoning period. The Monetary Authority of Singapore (MAS) also announced last Thursday the "exempt bond issuer framework", which allows issuers to offer bonds directly to retail investors at the outset without a prospectus if they meet eligibility criteria that are stricter than those used in the seasoning framework. 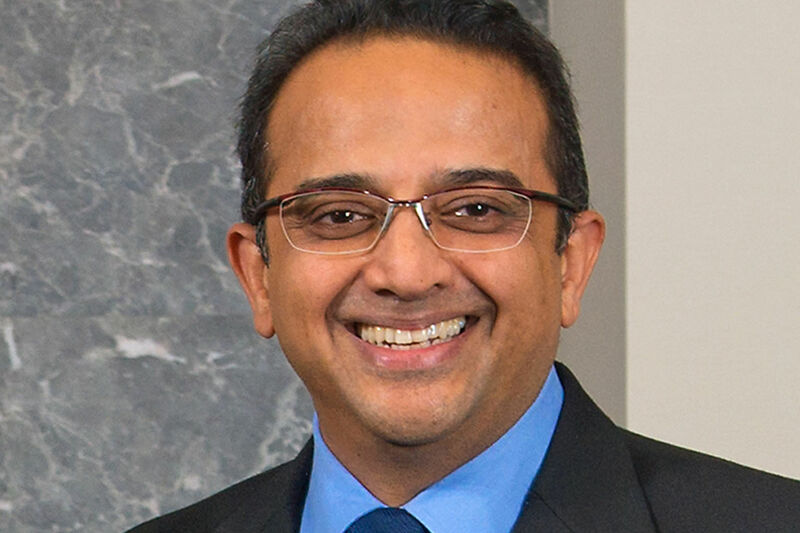 OCBC Bank's Mr Vasu Menon says investors can reduce downside risk by buying bonds with a shorter tenor of up to five years. Financial experts say that these enhancements to the regulatory framework to increase access to bonds would benefit retail investors by offering them more avenues to create well-diversified investment portfolios. Still, investors should do their due diligence and invest in only products which they understand and which meet their financial objectives and risk appetites, as investing in bonds is not without its risks. A bond is a debt instrument in which the firm or issuer borrows funds from investors for a defined period. There is a possibility the issuer could get into serious financial difficulties and default on the bond. An investor could lose part or all of his investments in a default. UOB's Ms Chung Shaw Bee says investors should know at the onset the terms and rating of the bond, and when interest will be paid on maturity. So be prudent and ensure that you are well-informed when investing in a bond by paying close attention to information other than the coupon rate or the bond's interest rate in the offering document. 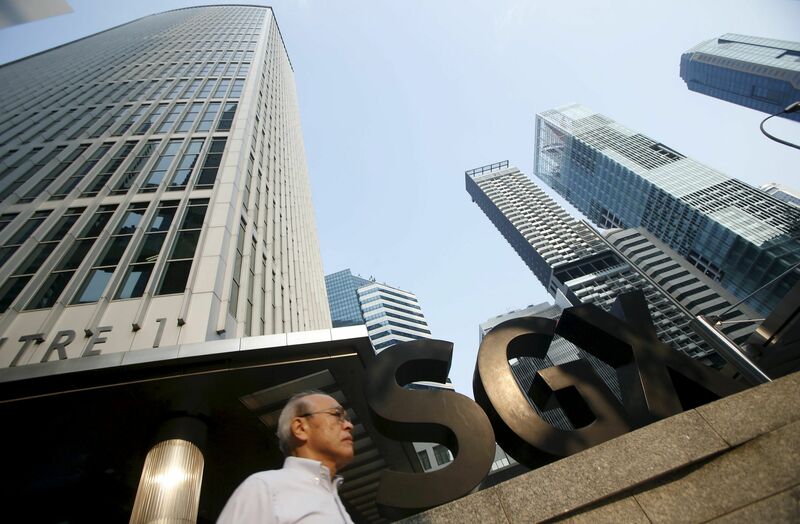 Factors to consider when investing in bonds Issuer's credit and financial profile: The SGX suggests that investors should look out for disclosures on the credit rating and leverage ratio of the issuer. A credit rating is a static assessment of the issuer's creditworthiness based on the methodology of credit rating agencies such as Standard & Poor's, Moody's and Fitch. 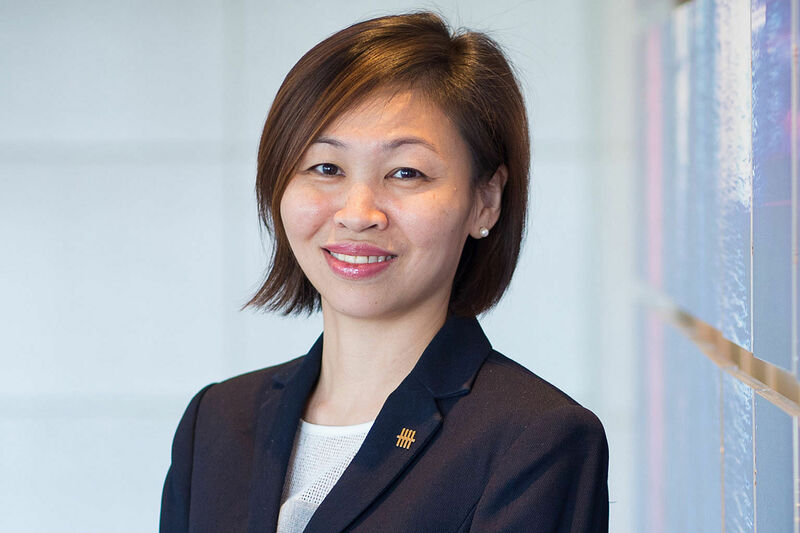 Ms Chung Shaw Bee, UOB's head of wealth management for Singapore and the region, highlighted that higher-yield bonds are usually from issuers with lower credit quality, which would be suitable for investors with a higher risk appetite. She said: "Such bonds give potentially higher returns but also come with the risk of the investor losing a substantial proportion of the original amount invested. "Investors with low risk appetites should look for bonds issued by companies with higher credit ratings. Bonds from such companies usually provide a lower yield, but are more stable." The leverage ratio comprises a set of different financial measurements that look at the amount of debt used by the issuer to fund its operations. The most popular measurement for this is the debt-to-equity ratio. A high leverage ratio could be of concern since it suggests high interest expenses which could increase the risk of a default or bankruptcy. Leverage ratios are also industry-specific and so should be compared with those of industry peers. The ratios should also be assessed in the light of the issuer's past records. Income and cash-flow statements should also be examined to assess the issuer's ability to meet bond obligations as they are due. Issuer's right to defer payment: The issuer may stipulate that it has the right to defer the payment of the interest due, or has the sole discretion to pay only part of the interest due, or has the right to defer any arrears in payment. Certain restrictions may be placed on the issuer should it exercise its right to deferral. For example, the issuer may not be allowed to pay dividends on its equity securities. Investors should therefore check if the issuer has the right to deferral and, if so, the existence and adequacy of other restrictions. Redemption triggers: It is prudent to understand the circumstances that will trigger a redemption of the bonds. When that occurs, the issuer returns the principal to investors. Redemption generally occurs at maturity. However, the offer document may state other circumstances where redemption would be triggered. Investors should take note of such provisions as they may shorten the tenor of the bonds. Common redemption triggers include changes in the taxation regime or where the percentage of the original bond issue which is still outstanding falls below a certain threshold. Status and ranking of obligations: Investors should pay close attention to whether the bonds are secured or unsecured, subordinated or unsubordinated. Bonds secured against assets give better assurance as the assets can be liquidated to repay the bonds if the issuer becomes insolvent or defaults. The subordinated versus unsubordinated ranking of bonds determines the order of repayment in an insolvency. Senior debt would generally have to be repaid before junior (subordinated) debt. This means that an insolvent firm's liquidated assets will first be used to pay the unsubordinated debt. Any cash in excess of the unsubordinated debt will then be allocated to the subordinated debt. As such, you may receive either a partial payment or no payment, if there is insufficient cash. Bonds rank ahead of equities in terms repayment priority. Use of proceeds: Check out the "use of proceeds" section of the offer document to understand how the issuer intends to spend the money raised. Read together with the issuer's financials, the section would help shed light on the issuer's long-term growth potential and strategic outlook. Investors should question perfunctory descriptions such as general corporate or working capital purposes. Monitoring performance of issuers: Continue to monitor the performance of the bond issuer after buying the bond. Investors should take note of any changes in performance that may affect the ability of the bond issuer to pay interest or to redeem the bonds upon final maturity. 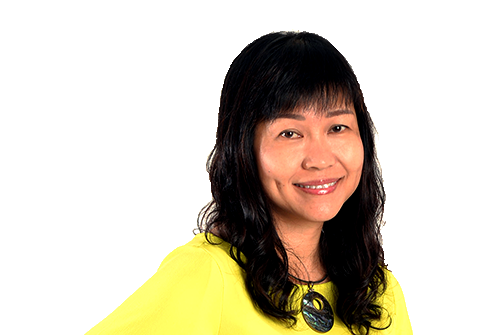 Financial experts say Ms Tan said: "The framework should be well received by those companies with intention to tap the retail market. "It would be ideal if the seasoning framework is able to attract issuances of more blue-chip retail bonds. "A primary consideration for issuers in deciding whether to tap the retail market would be cost and access to liquidity. Would extending the offer to the public result in lower net borrowing cost or increase the amount raised?" Mr Menon said: "If interest rates rise more sharply than expected, this could cause the price of bonds to weaken, given its inverse relationship with interest rates. "Bonds with a longer tenor tend to be more vulnerable to rising interest rates, which is why those looking to buy bonds can reduce downside risk by buying bonds with a shorter tenor of up to four or five years. "Also, liquidity risk is something to bear in mind as a seller may not be able to sell his bonds if there are no buyers for his bonds when he is ready to sell. "There may be a big gap between the seller's asking price and the buyer's bid price if the buyer is concerned about rising interest rates. "However, for those looking to hold their bonds to maturity, interest rate risk and liquidity risk are not very important as most bonds will be redeemed at par at the end of tenor, provided the issuer of the bond does not run into financial difficulties and defaults when the bond is due for redemption." Ms Chung said: "A properly diversified investment portfolio should have a mix of asset classes. "It is important for retail investors to understand the differences between the various asset classes, and the factors which can affect their portfolio returns. "For bonds, investors should know at the onset the terms and rating of the bond, and when the interest will be paid upon maturity. "As most bonds pay coupons regularly, investors can use bonds to generate cash flows." •To find out more about bond investments, you can register at www.sgxacademy.com to attend the Understanding Bond Investments seminar on June 16, 7pm to 9pm, at SGX Auditorium. The seminar is free.